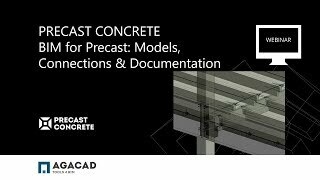 Precast Concrete enables easy and fast modeling of prefabricated concrete walls, floors, beams, and columns in Autodesk® Revit® with real-time project updates. Architectural or structural floors can be automatically split into various types of slabs (massive slabs, hollow-core slabs, etc.) according to predefined rules. Walls can be split into wall panels. Distribute connectors, cuts, plates, supports, anchors, grout tubes and other details according to predefined rules. Details can then be modified or updated to suit the project design stage and the level of detail required. Easy marking and renumbering of project elements based on properties and location ensure accurate bills of materials, quality production and accurate assembly on site. And fabrication information can be automatically generated with desired views, schedules, and customized drawings for each structural element. We also recommend the separate Cut Opening app for easily creating openings throughout a Revit model wherever MEP services intersect with walls, floors, and roofs. By downloading the Precast Concrete App, you will also receive our TOOLS4BIM Dock. The Dock gives you the option to install additional Revit add-ons developed by AGACAD. These other Revit extensions cover a range of industries, including Metal & Wood Framing, Ventilated Facades, Curtain Walls & Panels, Precast Concrete, MEP, and more. The trial version and full version are both included in the Precast Concrete App. After downloading the app, you will have the option to take a free 14-day trial or to purchase. Activation codes are sent via email.